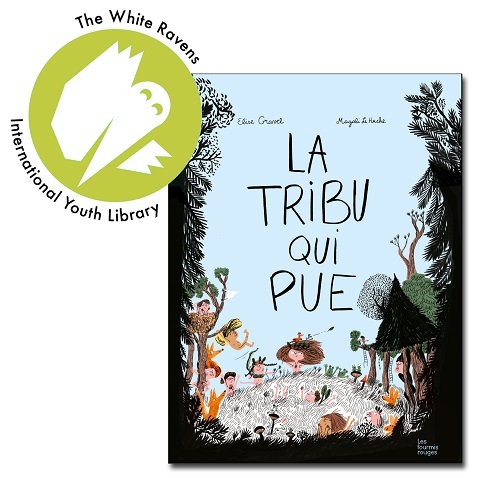 We received delightful news just before going to Frankfurt Book Fair that we are exciting to share with you now: La Tribu qui pue by Elise Gravel and Magali Le Huche, published by Les Fourmis Rouges is a White Ravens 2018! The rights are sold for Complex and Simplified Chinese, Catalan and Spanish (Spain) languages, but many countries don’t have a chance to get to know this fabulous tribe of naked children yet. For years, something has been driving Madame Carré up the wall. Right in front of “her” orphanage, a clan of happy kids live in a kind of self-determined children’s republic: without any supervision, in the middle of the forest, and naked! These children cleverly escape all of Madame Carré’s encroaching attempts to civilize them, and also consistently ignore all rules of “hygiene”. This means that the children almost never wash themselves and “stink” from every pore of their little bodies. But then Madame Carré figures out a fail-safe trick to get the anarchic brats into her orphanage once and for all and to employ her installed “whole body wash machines”. The lively French-Canadian duo Magali le Huche and Elise Gravel have created a funny fable with much attention to detail. Here children not only successfully resist the dressage of adults, but also deal adults a lesson that “comes out in the wash”.